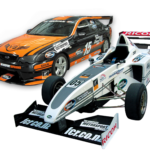 No one else in New Zealand can offer you the chance to drive a race-prepared V8 and single seater race car, all in one day!? This is a rare opportunity to see the world through the eyes of a racing driver in a full-on session that includes an in depth pre-drive tuition, a familiarisation lap with the chance to take a friend with you in the car, 1 full-on session in a V8 race car (8 laps - track 3) with one of our in-car consultants helping you along and finishing the day with a session (8 laps - track 3) of furious laps behind the wheel of our unique, Formula Challenge single seaters. You'll receive a certificate with your fastest lap time to take with you after our podium presentation. Please note that although no experience is needed these cars do have a clutch so drivers will have an advantage if they know how to use one. 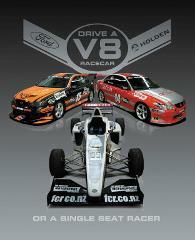 *NB All products are based on Taupo Track 3. However occasionally when we have to use Track 1 or 2(over twice as long) you'll get the same drive time or more on the track but you'll only do half the number of laps.